In my article I explained that this is a bluff, and I offered several examples of how life in the modern world depends of reliable, verifiable data; that it is not “epistemically atypical” at all. Ah, but then another of the lurking apologists felt compelled to dive in with more bluff and evasion. He too is puzzled by the Put-Up-or-Shut Up Challenge. I wonder if he understands the motivation for the challenge. For thousands of years, theologians have claimed to be privy to information about gods, but it turns out that their sources are highly unreliable; there is no way at all to verify the “information” that comes through prayer, visions, revelation, and scripture. Theists themselves disagree adamantly about whose prayers, visions, revelation and scripture are authentic. Just within Christianity itself the divisions and differences are beyond counting. Devout folks disagree about so much. 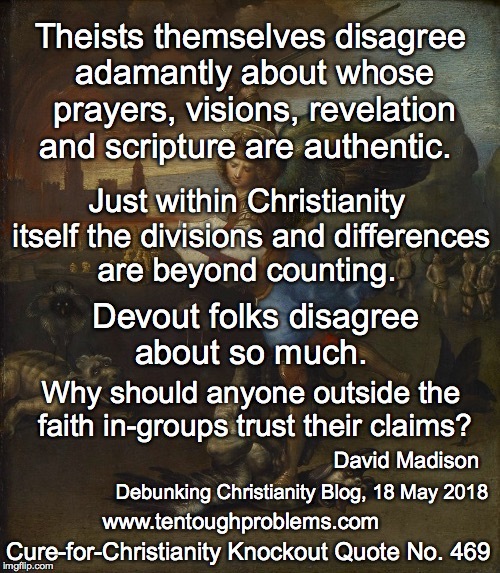 Why should anyone outside the faith in-groups trust their claims? Hence our challenge to show us where we can find reliable, verifiable data about God. Isn’t it about time to end the big bluff, for them to quit trying to fool some or all of the people…all of the time? Why didn’t I think of the ‘virtually all’ solution! We can determine how the Cosmos works by majority sentiment. Never mind that most the faithful who carry on ‘the major religions’ have been coaxed, cajoled and threatened into belief since childhood. Never mind that billions of believers have worshipped thousands of gods that are no longer taken seriously at all. And never mind that a lot of goofiness is accepted by billions of people, astrology being just one example. All of which tells us exactly nothing about how the cosmos works. It tells us what people believe. Notice as well how the apologist works hard to make sure God is unfalsifiable. 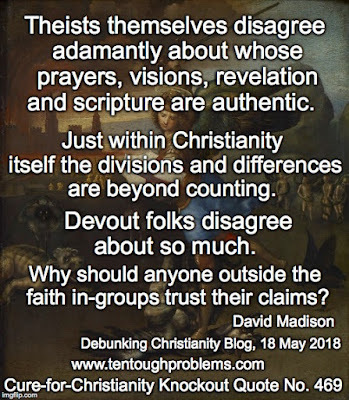 “How would you verify such an entity?” Well, if you put God out of reach, in exactly the way he prefers, then he has set the rules to keep his beliefs untouchable. Yet these God-fans claim that the deity is the most powerful, pervasive force in the cosmos, who monitors everything, even the thoughts of every person on the planet. But don’t be so foolish as to suggest that this God can be detected! Why would a good, caring God, who wants people to follow him in good conscience, even want to play the game this way? It doesn’t make sense to those who are not under the spell of religious. His first assertion, moreover, can get him into trouble: “Virtually all the major religions describe God as non-material.” Jaco Gericke has pointed out that the OT God was indeed thought to have a body (in his essay “Can God Exist if Yahweh Doesn’t?” in John Loftus’ 2011 anthology, The End of Christianity). So at least a couple of major religions didn’t begin with a non-material God; a bit of deity refitting has been required. But with the assertion of a non-material God, he’s in danger of a head-on collision with Catholic theology, which depends very much on God having physical properties: At every Mass, bread and wine are turned into the real body of Jesus. Seems like, every day, boosted by a little ritual, God crosses the line back into the real world! What Is the God Category? This is pretty much what the Put-Up or Shut-Up Challenge is all about: “…determine what category of things God is…” All skeptics and curious folks want apologists to show us where we can find out this kind of information, bypassing the tried and untrue “information” derived from prayers, visions, revelation and scripture. If you say too often, “How would you verify such an entity?” it will begin to sink in that no hard data can be found, anywhere. Skeptics are entitled to ask, “What is the difference between a being for which no data can be rounded up…and—wait for it—an imaginary being? “No reliable, verifiable data is available” looks mighty suspicious, and is not sustainable. “Oh, she’s right here,” I reply, waving vaguely. “I neglected to mention that she’s an invisible dragon.” You propose spreading flour on the floor of the garage to capture the dragon’s footprints. “Good idea,” I say, “but this dragon floats in the air.” Then you’ll use an infrared sensor to detect the invisible fire. “Good idea, but the invisible fire is also heatless.” You’ll spray-paint the dragon and make her visible. And so on. I counter every physical test you propose with a special explanation of why it won’t work. Now, what’s the difference between an invisible, incorporeal, floating dragon who spits heatless fire and no dragon at all? If there’s no way to disprove my contention, no conceivable experiment that would count against it, what does it mean to say that my dragon exists? But for those who are quite comfy with prayer results, visions of their favorite saints, revelations by trusted prophets, and treasured revealed scriptures, all these epistemological problems are just tiresome nit picking. “We’re happy to believe, thank you very much.” Christianity survives because this laziness, this failure of curiosity, prevails so widely. This second apologist began his response with: “Reliable? Who decides? Verifiable? By whom?” If apologists can move beyond their obviously unreliable and unverifiable sources of God knowledge—if they can show us where to find the data that should exist for a genuine all-powerful and pervasive deity—then serious thinkers who are disinclined to trust theists (who have never been able to agree on “spiritual truth” anyway) can evaluate the data. So, believers, get your act together. The Put-Up or Shut-Up Challenge still stands. We’re waiting. Though not as patiently as once upon a time.